When I offered to make my grandfather's birthday cake, I did so a little bit blithely. I hadn't fully thought through the logistics of making a cake for over 25 people, transporting it on public transport, and ensuring it was tasty enough for all but low enough in sugar to be suitable for my grandfather (he has well managed, non-insulin dependent type II diabetes). For my own benefit, I also wanted it to be vegan. Easy, right!? I was originally going to make a layered strawberry cake, but on testing the recipe it didn't work at all well. I abandoned that idea and subsequently found a BBC Good Food recipe for an orange and white chocolate sponge cake. The cake was neither vegan nor diabetes friendly but it sparked my imagination and I set about trying to make it both. As part of this process, I read up on what constitutes 'diabetes friendly'. I'd imagined needing artificial sweeteners or stevia, but the guidelines for diabetes seem to have changed since my childhood. I remember a primary school classmate with type I diabetes not being allowed any sweets or chocolate. These days, the message is that people with diabetes need to eat like all of us should eat: balanced, whole foods with occasional treats. Specific foods are no longer off limits, but there is a focus on eating well and having evenly distributed carbohydrate (and consequently sugar) intake across the day. Interestingly, the UK and US diabetes associations even advise against buying special 'diabetic' foods, such as diabetic chocolate. Having determined that moderation was key, I tried to work out how much sugar or carbohydrate I should have per serve in my cake. This was harder than it sounds as the guidelines vary, but I gathered that in a meal, someone with diabetes should aim for 45-60g carbohydrate. One set of guidelines suggested that 'carbohydrate friendly' recipes were up to 30g carbohydrate per serve, whereas 'low carbohydrate' was up to 15g per serve. Given my grandfather's diabetes is quite mild and this was a celebratory cake, I figured 30g carbohydrate per serve would be fine. To manage this, I reduced the sugar (and consequently also butter) in the recipe, added some orange juice to slightly offset that change, played around a little with the flour proportions, and used dark chocolate instead of white chocolate for the icing. To make the cake vegan, I used egg replacer instead of eggs, and soya cream for the icing. 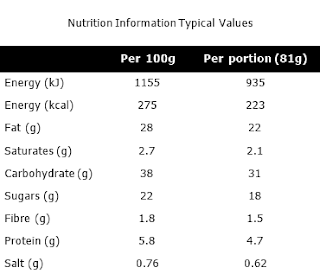 These adaptations gave 31g carbohydrate instead of the 45g of the original recipe, so I was quite pleased with myself. I did a test run of the orange sponge cake before baking the real thing, and it is an enjoyable cake even served plain. The orange flavours are dominant without being overpowering and it is beautifully moist. However, as the recipe isn't super sweet, the icing is what makes it a special occasional cake. You don't need to serve it in tiered form, but that does give an impressive result. I actually baked four cakes, but used two sandwiched together for the bottom layer. With hindsight, I could have just baked one large cake for the bottom layer, but I wasn't sure if my baking tin was large enough. 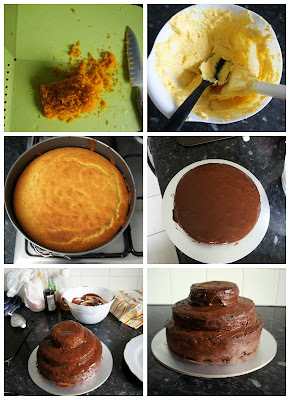 To make the layers as I did, you will need 5 inch (12cm), 7 inch (19cm), and 9 inch (23cm) round cake tins. If you just want a standard sized cake, divide the ingredients by three and use a single 7 inch or 9 inch pan. I decorated the cake simply, with a scattering of dried edible rose petals (bought from Tesco) and some edible gold glitter (bought from a pound shop, where I also got the cake board!). To transport the cake, I bought a standard white folding cake box from a nearby cake decorating shop, and a larger, sturdy box with sides that could fold down from a craft store. If you are making the cake to serve at home you won't need to bother with boxes, but the cake board is recommended. Heat your oven to 180'C / 160'C fan-forced (375'F). Grease your cake tins and line the bases with non-stick baking paper. Beat the orange zest, non-dairy spread and caster sugar in a large mixing bowl with electric beaters, for about 1 minute until golden and fluffy. Sift the flour and baking powder over the cake mixture and fold through. Add the almond meal and orange juice and fold through. In a separate bowl, whisk the egg replacer with electric beaters, for about 3 minutes until white, fluffy, and thickened. Fold one-third of this mix into the cake batter, using the whisk, and then repeat for the other thirds. Mix carefully. Divide the batter between your prepared cake tins. Bake until golden and a skewer inserted in the centre comes out clean - 30-35 minutes for the 9 inch cake, 25-30 minutes for the 7 inch cake, and 20-25 minutes for the 5 inch cake. Once cooked, allow to cool in the pan for 5 to 10 minutes before transferring to a wire rack to cool completely. Allow to cool for several hours or overnight before icing and decorating. Melt the chocolate, soya cream and non-dairy spread in a heatproof bowl, over a pan of simmering water or in the microwave. Allow to cool and thicken in the fridge, for 20 or so minutes. Place the bottom (9 inch) cake on the cake board and cover with a layer of ganache. Place the middle (7 inch) cake in the centre of the bottom layer and cover with ganache. Place the top (5 inch) cake in the centre of the middle layer and cover with ganache. Allow the first layer of icing to set for 30 or so minutes, ideally in the fridge, and then cover the tiers with a second layer of icing, creating a smooth finish with a knife. When the second layer of icing is done and set, sprinkle with rose petals and edible glitter. Have you made any cakes on a large scale? Or have any favourite celebration cake recipes? wow I am so impressed by this cake - it looks fantastic with all the tiers and sounds delicious too as well as keeping it healthy. I remember a school friend who had diabetes always brought Tab coke and chips when she visited so we loved her coming over. Diabetes seems to have be a health issue for a long time so it is interesting how the guidelines have changed over that time, especially given all the sweeteners like stevia that are around these days. Yes, I was so surprised that diabetes guidelines aren't full of sweetener recommendations! I rather like the shift but am sure sweeteners are still very helpful for diabetics with a sweet tooth. Thanks for your comments on the cake too, I am really glad it managed to come together. Very impressive, not only the final product but all the thought and calculations that went in to it! I'm not up to speed on modern day diabetes advice, but I do know that advice given for kids with eczema is different to what it was about seven years ago when we were treating my son! Gosh, guidelines change so quickly! That is one delicious looking cake. Chocolate and orange are the perfect sweet combination. What a terrific looking cake. Lucky grandfather!